This past Christmas, I got a call from a husband wanting to do something special for his wife for a gift. We put together a “Queen for the Day” package. Who doesn’t want to be a queen for the day? I’d settle for being a princess every once in a while! 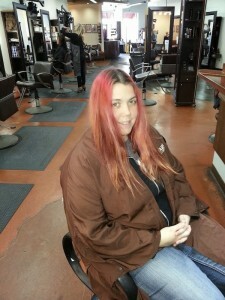 I met with Dawn and we started with her hair at Douglas Carroll Salon. Dawn had always enjoyed dying her hair a vibrant color about once a year. She acknowledged it may be time to step away from store-bought brights. Quick and easy is her motto like so many working moms of today. At what point does quick and easy become not age appropriate and not really the best we can be? Is it easier not to care than to take time to figure it out? Self-style evaluation can easily happen by simply looking in a mirror or seeking advice from fashion books or magazines. Updating our style shouldn’t be a struggle, something that we put off, afraid of what we might actually feel. As we age, our style needs change. It is a matter of allowing ourselves the gift of asking for help, whether it is from a stylist, a book or a hair salon. 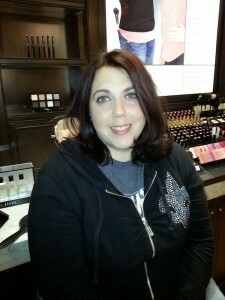 After we left Douglas Carroll Salon, our next stop was Belk at Crabtree Valley Mall for brows and makeup. Check out this transformation. Clinton and Stacy have nothing on me and the crew that helped! After the hair and makeup update, I sent a picture of Dawn to her husband. He quickly responded with, “Beautiful!” Dawn clearly was equally pleased and so taken aback by her beauty and transformation that she teared. I was happy to share that moment but had to call in the cavalry for makeup touch-ups! Just for the record, my usual mantra….I love my job! 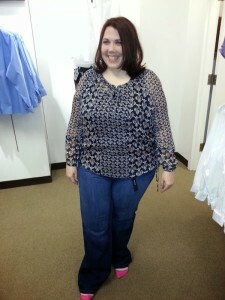 Clothes were the last component of becoming “Queen for the Day.” Dawn’s casual lifestyle needed some updating from t-shirts and jeans, to soft feminine tops and jeans. Accomplished. Perfect for her casual work environment and life on the go with two girls. So what is the missing link? Would Dawn ever have given herself the gift of dressing not only for her lifestyle but updating her overall look? I’d like to think at some point she would have gotten around to it. We all deserve to grow gracefully with a new hairstyle, an occasional skin and makeup update, and clothing that really states who we are and where we are going! As for Dawn and her updated look, how can you do anything but smile? 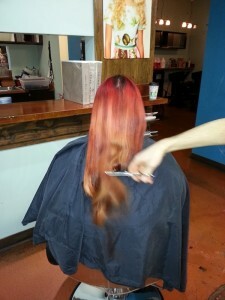 Dawn looked truly beautiful and she was really receptive to trying something new. She was a pleasure! I’d like to give special thanks to Brandon Partin at Douglas Carroll Salon and Brent Usrey at the Bobbi Brown Studio at Belk in the Crabtree Valley Mall. Both are stellar artists in their fields.